Don't let the winter blues beat your workout motivation to the ground. Stay motivated through the cold weather with these 9 tips from the amazing athletes of NLA for Her! With holiday gatherings and parties galore, the winter months typically start out fun and full of cheer. But then the social hubbub subsides, and somewhere between a freezing January and a wet March, high spirits can turn into the winter blues for even the most motivated among us. Although it may be tempting to find the nearest pillow, blanket, and dark cave so you can hibernate until spring, exercise is a much better strategy for relief from the seasonal doldrums. When you're just not feeling great, however, even your workout motivation level can fall to zero. But there's no need to worry. Help is at hand! The amazing ladies of NLA for Her are here to help you overcome your winter workout blues. Whether you suffer from occasional seasonal irritability or something more like seasonal affective disorder (SAD), their ace advice can help you feel a little brighter, stick to your fitness goals, and overcome whatever snowballs winter pitches your way. Then, once sunny spring arrives, you'll be looking great and feeling even better! Depending on where you live, one of the dreariest things about winter is how bland everything can look—gray streets and gray skies don't make the prettiest picture, after all. To overcome this, sometimes all you need to do is change the environment you can control! "This could be your workout space, the music you are listening to, or even your workout clothes," says NLA athlete and IFBB pro Jessie Hilgenberg. If it's dreary outside, you have to do everything you can to add some color to your world. "Buy some new leggings you love, or sign up for a guest pass at a brand-new gym for a week." Change can be scary, especially when you've been following the same routine for a long time. However, a little change may be exactly what you need for a spark of motivation and positivity. Once you get that fire burning again, keep at it! If it's dreary outside, Jessie Hilgenberg does everything she can to add some color to her world. If it happens to be a sunny day, make an outside jaunt even more of a priority. Grab your dog, your snow boots, and a pair of sunglasses. Enjoy the spectacular sights that only winter can bring. It's much harder to crawl into your winter-blues cave when you have a friend waiting for you at the gym! 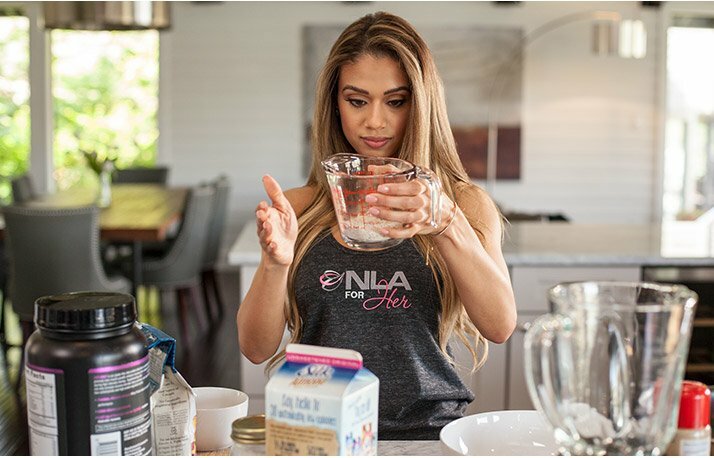 "A workout buddy will help hold you accountable so you will feel more motivated to train," says NPC bikini competitor and NLA athlete Theresa Miller. "Set short-term weekly goals for each other, and be sure to make your workouts fun. Try new exercises, and cheer each other through your workout sessions." When selecting a workout partner, make sure he or she has similar fitness goals. It's helpful to know that your partner will be willing to push you when you need to be pushed and will allow you to push when he or she needs it. Adding a little caffeine to your pre-workout regimen may be just what you need for an increased boost of winter workout motivation. "If you have never used a pre-workout before, try adding one to your regimen," says Hilgenberg. Hilgenberg considers a pre-workout and branched-chain amino acid (BCAA) combo one of her secret weapons. In fact, Hilgenberg considers a pre-workout and branched-chain amino acid (BCAA) combo one of her secret weapons. "NLA for Her Uplift is a great option," she says. "I love mixing one scoop of cherry limeade with one scoop of NLA for Her Her Aminos Dragon Punch flavor 30 minutes before I lift." This combo provides "just enough of a kick to re-ignite your workouts," Hilgenberg says, "but doesn't include so much caffeine that you feel overstimulated." Increasing the difficulty of your workouts can do a lot for your mood and your motivation. "Getting through a tough workout will leave you with a sense of accomplishment and enhance your mood for the rest of the day," explains DeLeon. High-intensity workouts are also great because you can cut back your total gym time to 30 minutes or less. If you typically spend your time slugging away on the treadmill, try a quick high-intensity interval training (HIIT) session on the treadmill, or hit up the free weights for a hard-hitting circuit-training workout. If you've never done HIIT before, just think of it as an alternating mix of sprints and slow walking or jogging for recovery. One easy workout you can do on any piece of equipment is to work hard (or sprint) for 30 seconds, cool down for 30 seconds, and then repeat for a total of 15-20 minutes. If the endorphin release doesn't quickly boost your mood, the results you see from these workouts certainly will! This advice might look strange at first glance, but eating more fatty fish may actually help you feel more positive. "Some research has shown that an increased intake of omega-3 fatty acids in your diet can help ease mood swings," says DeLeon. That means it's time to serve up some salmon! Of course, occasionally eating salmon may not give you enough omega-3s to make any kind of lasting impact, which makes supplementing with a good omega-3 supplement a smart move. Women also tend to get less omega-3s in their diet than men, so supplementation is an easy way to rectify any deficiency. If your gym motivation goes out the window in the winter, so does your determination to eat healthy. Instead of reaching for a bottle of wine and a box of clearance-rack Valentine's Day chocolates, head to the kitchen to make some healthy meals. "Having healthy meals handy when you need them will help reduce the chances that you turn to less-than-healthy foods on those tough days," says Miller. Instead of reaching for a bottle of wine and a box of clearance-rack Valentine's Day chocolates, Lais DeLeon heads to the kitchen to make some healthy meals. It's also a great idea to check out healthy recipes so you can get inspired to try something new in the kitchen, which may also help you kick the winter doldrums. After all, fueling your body with whole, healthy foods will make you feel much more energized and positive than when you fill it with sugar and alcohol. Your goal for the winter should be to make yourself as well as possible, inside and out. When you're under a blanket of winter blues, finding internal motivation can be tough. When that happens, you may have to look to the internet and other external sources for inspiration. "I like to watch motivational YouTube videos of some of my favorite female athletes," says DeLeon. "If you know what videos or photos motivate you most, save them on your phone or bookmark them for easy access when you're in need!" If watching videos doesn't cut it, try searching for new music. "Make an upbeat and happy playlist," suggests DeLeon. New music can invigorate your workouts and give you new reasons to hit the gym. Podcasts and audio books work well for some people, too. If you only have a long-term goal on your fitness calendar—such as "get lean and strong for the summer"—then you're missing out on the power of short-term goals. Your long-term destination can seem especially distant when you're moody and unmotivated, which makes it critically important to set smaller milestones to keep yourself positive and on track. One of the best ways to stay inspired through the winter months is to set some short-term goals, and then reward yourself when you hit them. One of the best ways to stay inspired through the winter months is to set some short-term goals, and then reward yourself when you hit them. "Splurge on new pair of running shoes after you have successfully reached your goal of hitting the gym three times per week, three weeks in a row, for example," says Hilgenberg. "Once you accomplish that goal, keep setting new ones!" If you need even smaller goals to get you through the winter, set them. Even daily goals like "drink two extra glasses of water" or "try a new exercise" can make a big difference in your mood. Continue to set goals and before you know it, winter will have flown by!